Today I participated in my first edcamp. A great experience for me! I have been teaching quite a few years, and participated in workshops and conferences before, but this was something else! I participated in edCampAsker which was initiated by Thor Ivar Eriksen, @pute68, and organized with Simen Spurkland @simenspurkland and Ingeborg Gude @GudeIngeborg in Asker Kommune. First everyone got to brainstorm ideas they’d like to have as topics in this edcamp. We put our ideas on notes, and next we voted on the topics we’d like to discuss. The organizers then put together the program based on which topics belonged together, and which got the most votes. Everyone could attend any seminar, and walk out too, if it wasn’t what you thought it was. A great concept. This is why edcamps are called unconferences, they are free, and based on the ideas of the participants. The first session I attended was about flipped classroom. Everyone shared experiences, and ideas of how to use this method in our classes. What was very interesting to me, was other teacher’s examples of what had worked for them, and how their pupils and parents have responded. Great examples came from Charlotte Lundell and Marthe Johnsen @marteswritation, both from Larvik kommune. My next session was about deeper learning and critical thinking. This session resulted in a great discussion with teachers from both primary- and secondary level schools. The most interesting example came from Simen Spurkland. He told us about how he and his colleagues at Vøyenenga skole in Bærum kommune created a cross curricular topic which lasted about two weeks. In this period the students had goals to complete each week, and the end goal was an art exhibition where the students assessed each other’s end products, the teacher assessed the process, and a report made by each student. A great learning experience, and an inspiration for me regarding developing my own practice as a teacher! The final session I participated in concerned design of digital tasks. Many counties and schools in Norway are going all in with digital devices for all the students in both primary- and secondary schools. My school; Ramstad skole, is a secondary school in Bærum kommune, where all our students got an ipad each this term. This requires that the teachers learn more about how- and when we should use digital devices. The discussion in this session centered around the principle of the SAMR model developed by Dr. Ruben Puentedora. The idea is to use technology not only to substitute tasks done by hand before on apps and devices, but to create new tasks and learning processes altogether. We discussed our experiences, and this is where I shared my experiences with eTwinning. eTwinning is the community of teachers and students in the EU. It promotes project based learning, where teachers can connect their classrooms and create tasks where the students need to communicate with students in other countries, learning more about cooperation, cultures, language and digital skills. The possibility to learn more with other teachers are great, and you can design digital tasks together which reach the highest levels in the SAMR model. I invite everyone to check it out, and see if it is something they’d like to try! I was lucky to connect also with Eva Steffensen @EvaSteffensen from Oslo kommune today. She shared her experiences using Apple’s Garageband app, which allows students to create their own music when they make digital news presentations in a video, or need background sound for their book trailers. A great idea for me to explore with my students! After this, my first edcamp experience, I have got a lot of new ideas about how I can develop my practice as a teacher! I have made new connections with teachers I learnt from and hope to collaborate with in the future, and I definitely want to come back next year! Hopefully, you want to come too? 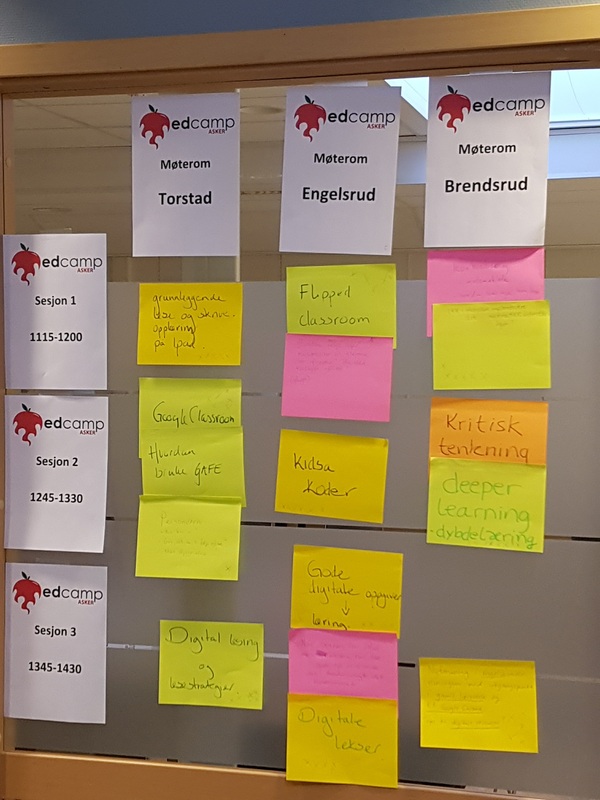 A big shout-out goes to Thor-Ivar Eriksen, Simen Spurkland and Ingeborg Gude, who organized this edcamp, and to Asker Kommune, which lent its facilities to the edcamp and provided lunch for all the participants!